When Americans think of first responders, they may picture firefighters, police, and EMT workers. Demolition contractor should also be included in this list. Industrial Demolition contractors played key recovery roles following the September 11th attacks, the US senate anthrax contamination, and the bombing of the Alfred P. Murrah building in Oklahoma City. From cleaning up collapsed roadways and structures following the 1989 California earthquakes, to clearing Senator Tom Daschle’s office after anthrax contamination, demolition contractors play a variety of roles in disaster recovery and clean up. Working in tandem with firefighters, police, and other first responders, demolition contractors also help clean up floods, hurricanes, tornadoes, and other natural disasters. Let’s take a look at some of the ways demolition workers help clean up disaster sites. How Industrial Demolition contractors aid in recovery and cleanup at disaster sites. 1. Stabilizing and Removing Destroyed Buildings and Debris for Public Safety. In the hours following a disaster, emergency demolition contractors can bring down dangerous parts of buildings immediately. Demolition contractors have the resources to begin clean up right away, and they have transportation resources available to remove debris immediately. 2. Conducting Controlled Demolition to Assist Investigators – Demolition contractors have the tools and expertise needed to remove buildings piece by piece. This sort of precise work is required to determine the origin of fires and other disasters. Demolition contractors can carefully remove debris without disturbing or tainting evidence. 3. Identifying, Removing and Disposing of Dangerous Materials. A disaster site may contain environmental hazards, toxins, and regulated materials. Demolition experts to can identify, safely remove, and properly dispose of dangerous materials, according to state and federal regulations. 4. Provide specialized equipment to free trapped victims. Minutes and seconds can mean the difference between life and death for trapped victims. 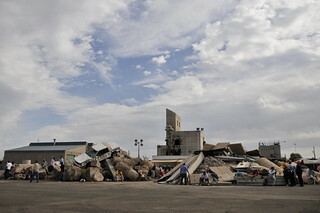 Demolition firms maintain specialized equipment for accessing unstable buildings after a disaster. For instance, to check a certain cut-off chamber for victims, a demolition firm could employ a hydraulic excavator with a special camera. This could breach concrete walls to show any victims stuck inside. 5. Equipment to tear down and clean up buildings. In medium to long-term cleanup efforts, industrial demolition companies play a starring role. They have heavy equipment, such as high-reach excavators to safely remove structural components while reducing the risk for workers. The National Demolition Association (NDA) maintains a database of demolition contractors who are qualified to assist local, state, and federal emergency response teams. “We have the trained people, the right equipment, the awareness of structures. We simply want to be of help,” explains Mike Taylor, NDA Executive Director. To this end, the NDA provides a pre-qualification checklist that agencies can use to choose post-disaster demolition partners. The Occupational Safety & Health Administration (OSHA) also provides a voluntary training program for Disaster Site Workers. While it is not federally required for demolition contractors to undergo this training, local and state agencies may require contractors to take it before working on disaster sites. The OSHA training includes information on air respirators, decontamination procedures, potential disaster site hazards, traumatic incident stress awareness, and PPE (Personal Protective Equipment) to wear while working disaster areas. OSHA emphasizes that pre-incident training is required to make disaster response as effective as possible. Local agencies should have partnerships arranged with local demolition experts to smooth disaster recovery efforts. This entry was posted in Industrial Demolition and tagged industrial demolition contractors. Bookmark the permalink.